You are here: Home / Weekly Columns / Opinion / Amazon Fire HD 8 Has Everything You Need In a Budget Tablet. (ThyBlackMan.com) Both the new Amazon Fire HD 8 and its Kids Edition version are great deals to look for this year. If you are on a budget, but are looking to buy one tablet with 8-inch HD display, better battery life, great storage capacity and a voice assistant, Fire HD 8 is the one you can choose without a keeping a doubt. There’s no denying that its camera looks cheap, and is not up to the mark. Well, rarely people consider camera quality when buying a tablet, but if the camera quality is your concern, Fire HD 8 may disappoint you. What’s The All-New Amazon Fire HD 8? Last year, Amazon introduced Fire HD 8 and just like the other Amazon tablets, it didn’t break the market and couldn’t meet the expectations of many. But this year, Amazon has revamped its tablet and now the new Fire HD 8 tablet looks more polished and feels better than the 6th-generation version. Let’s have a look at what the new Amazon Fire HD brings for tech enthusiasts. Technically, there’s nothing significantly new in this year’s Amazon Fire HD 8. However, the company has managed to introduce one kid-friendly version of the tablet. Earlier, the Fire Kids Edition tablets have seen great success in the last year. The new Kids Edition comes at a higher price tag than the original Fire HD 8, but it appears to be worth buying. What’s New In Amazon Fire HD 8? 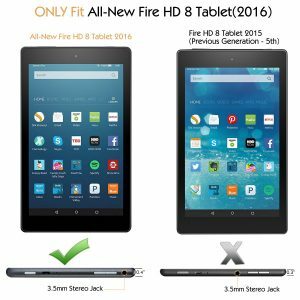 Both the old and new devices are known as Fire HD 8, but there’s a difference in the tablets from both the generations. The new tablet is 0.5mm thicker, and it is also heavier than the old one. The new tablet has a better graphics chip and it supports microSD card up to 256GB, while the 6th-gen tab allows you to extend memory with a microSD card up to 200GB. The major difference between the Amazon Fire HD 7th generation and 6th generation is their price tags. The new tablet costs US$10 less than the previous one. Amazon has also removed gyroscope from the new tablet. If you were expecting any other changes, improvements in the new tablet, you should not. The tablet sports a 1280×800 HD display and a slimmer design. The device also gives you an extra hour of battery life. The HD display is far better than the Fire 7-inch tablet and looks brighter and contrasty. The 32GB model of the Kids Edition comes with a protective case. Amazon also offers a two-year replacement guarantee and one year FreeTime Unlimited content subscription. One good thing about the Amazon Fire HD 8 is that it is coming with Alexa. The artificial intelligence based voice assistant by Amazon will be capable of responding to your every single voice command. Whether it is about reading a book or finding a nearby restaurant, checking flights or weather condition, HD 8 is completely a budget-friendly solution with so many features. With the arrival of more powerful Alexa, the device can be considered as a great alternative to the company’s Echo Show, which is a portable voice assistant like standard Echo that comes with a display. Amazon doesn’t break the sales records with its tablet, but the company has already expanded into the gadgets market. The best thing is that Amazon doesn’t disappoint people who look for tech gadgets in budget. The company’s customer retention strategy is working well and is driving more profitability. According to Amazon, even when the tablet market is slowing down, the company’s tablet and kindle product line is growing well. Amazon’s internet based services such as Amazon Prime video streaming is one of the major services Amazon delivers for the tablets. So, now when both the upgraded models are coming with Alexa, it is sure that it will enhance the user experience and allow consumers to ask Alexa to play music, videos and movies through voice commands. I see people still are buying tablets. I’m still rocking with my old Asus Nexus 7 tablet. If I was to every upgrade I would choose between the Apple iPad, and Amazon Fire tablets.